Black Enterprise Names Kim Crawford Goodman of Fiserv One of the Most Powerful Women in Corporate America - Fiserv, Inc.
BROOKFIELD, Wis.--(BUSINESS WIRE)--Mar. 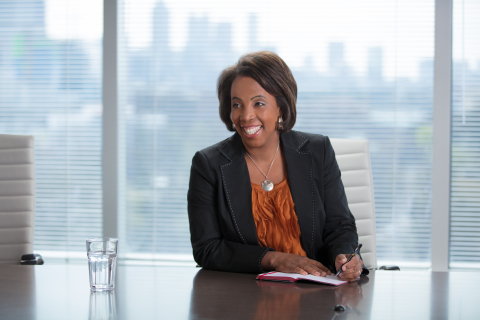 4, 2019-- Fiserv, Inc. (NASDAQ: FISV), a leading global provider of financial services technology solutions, congratulates Kim Crawford Goodman, President, Card Services, Fiserv, who has been named one of the Most Powerful Women in Corporate America by Black Enterprise magazine. Fiserv, Inc. (NASDAQ: FISV) enables clients worldwide to create and deliver financial services experiences in step with the way people live and work today. For 35 years, Fiserv has been a trusted leader in financial services technology, helping clients achieve best-in-class results by driving quality and innovation in payments, processing services, risk and compliance, customer and channel management, and insights and optimization. Fiserv is a member of the FORTUNE® 500 and has been named among the FORTUNE Magazine World’s Most Admired Companies® for six consecutive years, recognized for strength of business model, people management, social responsibility and innovation leadership. Visit fiserv.com and follow on social media for more information and the latest company news.